A simple microwave egg sandwich recipe. 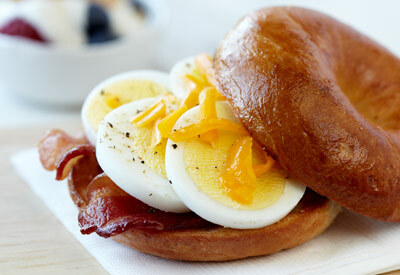 Layer sliced hard-boiled egg, meat and cheese on a bagel for a simple breakfast or lunch. ARRANGE bacon strips on bagel bottom. ARRANGE egg over bacon; season with salt and pepper, if desired. TOP with cheese. MICROWAVE on HIGH 30 seconds until warm and cheese melts. Cover with bagel top. SERVE with maple syrup, as desired. Hard-cooked egg storage time: In the shell, hard-cooked eggs can be refrigerated safely up to oneweek. Refrigerate in their original carton to prevent odor absorption. Once peeled, eggs should be eaten that day.